Need a landscape gardener in the Alwoodley or Moortown areas? Call us! We have all your gardening needs sorted - affordably. 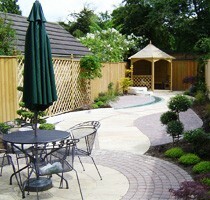 We design, construct and maintain gardens making them attractive, useable and problem free for years to come. With years of industry knowledge and gardening experience we’re the best solution for every garden job. All our staff are trained to a top class standard and we cater to each individual’s exact specifications, so you will get the garden you demand, and at a budget friendly price. Our honest and reliable team of landscape gardeners are waiting for your call, so ring us now. Our reputation is based on reliability and outstanding service. You know you are in safe hands when you choose us, and this is reinforced by the fact that all our work is fully guaranteed. Whether it’s a full garden transformation or just a tidy up, we’ll give you a free estimate on all work. We're local to Alwoodley or Moortown, so pick up the phone today to speak to the specialists. If you need a quality landscaper, call us today by dialling Leeds 0113 370 9072.